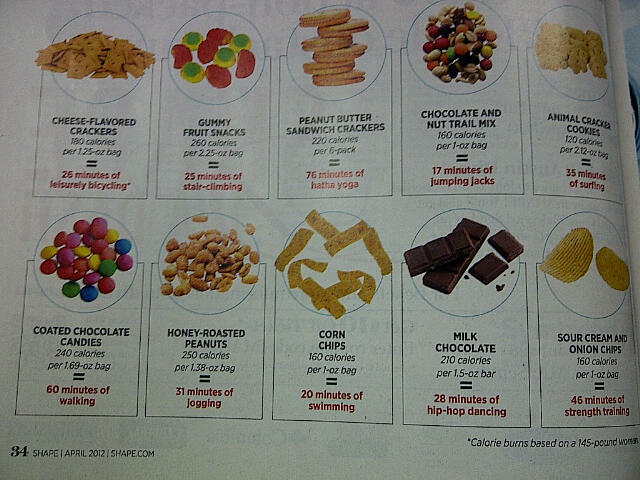 This information appeared in Shape magazine (April 2012), one of my favourite magazine. The visual and calorie information gives us a good indication of the price we need to pay for that impulsive treat indulgence. 6 peanut butter sandwich crackers- 220 calories per 6 pack- 76 min of Hatha yoga. It’s not easy to burn off the calories even from 1 cup of 3-in-1 coffee that we are taking in- just a cup and it involves 30 minutes of Body Combat class to burn it off. So what happens if we don’t exercise after eating all these food? Our muscles would atrophy and the fat would just slowly build up until one day you find you cannot fit into your pants and skirts which you were wearing a year ago (my true horror story). RELATED: Spot Reduction- does it work? A new study from University of Exeter in England showed that people who took a quick 15 minute scroll before sitting down to a task ate only half the amount of candy as those who have rested on their desks. “Breaking up sedentary behavior with even short bouts of activity can help curb your cravings“, says Adrian Taylor, Ph.D, lead author of the study. Exercise not only serve as a distraction, he explains, but it also increases your body’s levels of endorphins, which can combat stress and supress your appetite. Why not give it a try? We may not have the luxury to take a walk down- but for myself, I would take short walks and even use the washroom of the floor above- I take the stairs to get there, on top of the stairs I took in the morning, lunch and after work.